For as long as I can remember we've always had crab cioppino on Christmas Eve. It was a tradition started by my Grandma Ida, and one that I have vowed to continue in my own home since she passed away last year. I'm working on perfecting the recipe, though I know it will never be quite like hers. It's not a difficult recipe, by any means, and ours last night was beyond delicious, but there are some things that will just always taste better when prepared by a loved one. Especially a grandma. Grandma Ida lived in a hilly town on the peninsula just south of San Francisco. Being a traditional San Franciscan dish I'm fairly certain we're not the only family that eats crab cioppino during the holidays. It's also known as San Francisco Cioppino, California Cioppino, or just plain Cioppino. If you're a native (or a transplant who's been there long enough) and you hear "cioppino" you'll know exactly what seafood is in it: Dungeness crab, scallops, shrimp, clams, and some type of white fish. All simmered in a tomato sauce flavored with garlic, onions, white wine, and fresh herbs. Because you use your fingers (as well as a spoon) to eat this Grandma Ida always supplied us with flour sack bibs and finger bowls with warm water and lemon. Big slices of toasty garlic bread always helped sop up the delicious soup too. Remove the legs and claws from the crabs and break the body in half, reserving as much of the "crab butter" as possible (the yellow-colored center). 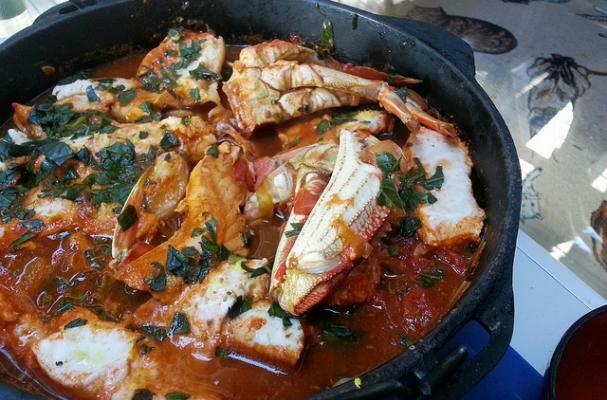 Set crab pieces aside and force the crab butter through a sieve into a small bowl. Set aside. Place the clams in a pan, add 1 cup of wine, and steam, covered, over medium heat for 5 minutes or until clams open. Remove clams and discard any that do not open. Strain the stock through a cheesecloth and reserve. In an 8-quart saucepan, heat the oil. Add the onion and garlic and sauté over medium heat until soft, but not browned. Add tomatoes, tomato paste, and remaining 2 cups of wine, pepper, herbs, and clam stock. Partially cover and simmer for 20 minutes. Add the fish, scallops, shrimp, crab, and crab butter. Simmer for approximately 5 minutes or until all seafood is cooked; do not stir or the fish will break apart. Add the clams and heat for 1 minute. Sprinkle with parsley and serve immediately from the pot. Oh my goodness, I love seafood. I would be in heaven eating this, It so looks delish! Bread was created for dishes like Cioppino. We made cioppino last weekend, a preemptive way to get our seven fishes out since we were not doing Christmas Eve proper. My aunt said it was cheating. Whatever, it tasted great!